After a meeting in Rome, the Cabinet cut its target for growth this year to just 0.2 percent. That figure, down from 1 percent previously, includes the estimated impact of measures the government has already agreed on to implement to help the economy. Expansion this year would be 0.1 percent without the steps. Even before the grim numbers emerged, they ignited new tensions within the coalition of the anti-establishment Five Star Movement and the rightist League, each of whom have pushed hard for their own budgetary priorities. Now, the lack of fiscal space will force them to compromise on spending and taxation. One year into their contentious co-habitation, the populists have not shown much ability to compromise. Tempers flared at a series of meetings before the official Cabinet sessions, Italian media reported Wednesday, as each side accused the other of championing expensive, unrealistic policies that don’t promote growth. Both the League and Five Star, in turn, have clashed with the Finance Ministry over budget issues. 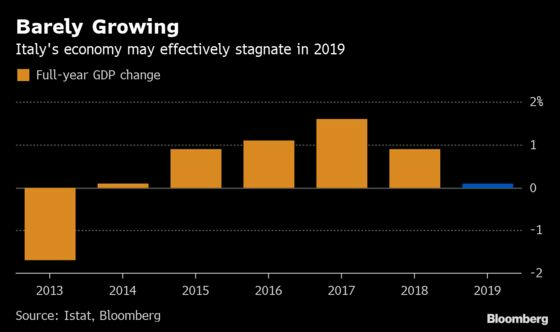 The new forecasts spell out starkly the dire economic situation in Italy, where the economy fell into recession at the end of last year. Plans for new tax brackets of 15 and 20 percent on personal income, a measure pushed by the pro-business League, featured in a draft of the outlook document Tuesday. But these numbers were deleted in the final version, according to Italian media. Disagreement within the Cabinet, with Finance Minister Giovanni Tria warning that measures couldn’t be financed without raising VAT, led to a less ambitious version of earlier proposals for a full flat tax, newspapers including La Stampa reported Wednesday. The government’s new deficit target for 2019 is 2.4 percent of GDP. Given the coalition’s full-on warfare with the European Commission late last year before agreeing on 2.04 percent, the higher figure raises the specter of renewed conflict with Brussels after European Parliament elections in May. To be sure, recent economic data and indicators suggest that the recession Italy slipped into might have come to an end in the first quarter. 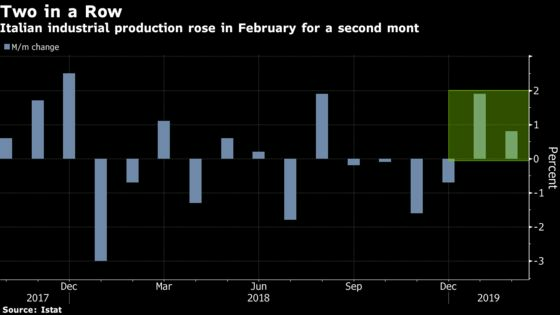 Industrial output unexpectedly increased for a second month in February, statistics institute Istat said in a report on Wednesday. 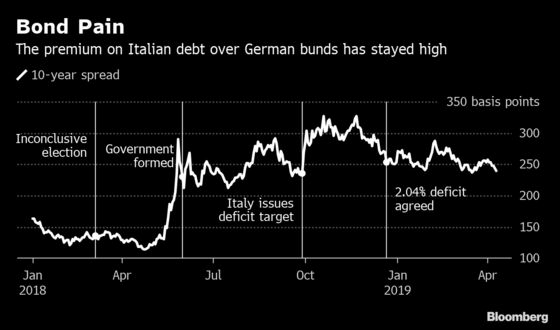 Separately, the Treasury said in a statement that Italy plans to cut its public debt to 131.3% of GDP next year and to 130.2% in 2021. The government also targets a primary surplus, the difference between tax receipts and public spending net of interest payments, at 1.2% of GDP this year. That’s down from 1.6% in 2018. Italy maintained its privatization target of 1 percent of GDP for this year, while seeking revenue from privatizations at 0.3 percent of GDP in 2020. The government may meet this year’s target by transferring stakes worth a total 10 billion euros ($11.3 billion) in Eni SpA, ENAV SpA, Poste Italiane SpA and STMicroelectronics NV to state lender Cassa Depositi e Prestiti, Il Sole 24 Ore reported Wednesday.